Fuel tank capacity: approximately 50 litres (petrol) or 45 litres (Diesel). When the fuel tank minimum level is reached this warning lamp comes on on the instrument panel. When it fi rst comes on there remains approximately 5 litres of fuel in the tank. If you run out of fuel (Diesel), refer also to the "Practical information" section. A label affi xed to the inside of the fl ap reminds you of the type of fuel to be used depending on your engine. 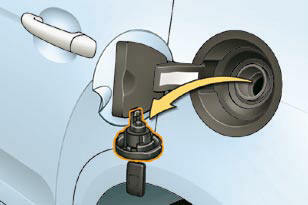 Additions of fuel must be of at least 5 litres, in order to be taken into account by the fuel gauge. 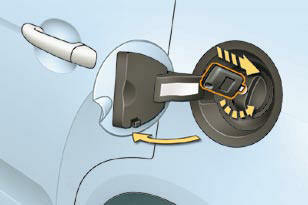 The key cannot be removed from the lock until the cap is refi tted. Opening the fi ller cap may create a noise a caused by an inrush of air. This vacuum is entirely normal, resulting from the sealing of the fuel system. fi ll the tank, but do not continue after the 3rd cut-off of the pump ; this could cause malfunctions.